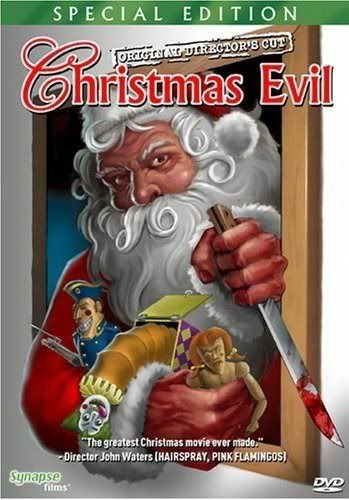 If you haven’t seen Christmas Evil, you have a treat in store. In fact, stop what you are doing right now and track down a copy. It is perfect 90 minutes of crazy low budget 80s horror heaven, and even better is one of the few seasonal treats to draw attention away from the obnoxiousness of rampant triteness and consumerism. In short, it was cheap, it was bonkers, it was christmasy, and I loved every moment of it. If you don’t believe me, check out the quote from John Waters on the poster. As child, Harry Stadling (Brandon Maggart) was traumatised at Christmas. Mommy kissing Santa Claus’ playing in the background. Perfect). Rather than drive him away from Christmas as an adult, Harry is obsessed with, or maybe that should be possessed by, the festive season, down to his red and white pyjamas and job in a toy factory. Best of all, Harry has a big book in which he records the good and bad behaviour of the local children. To cut a slightly, correction, incredibly bizarre story short, Christmas rolls round and Harry goes the whole hog, dressing like Santa, painting a sleigh on the side of his van and dishing out presents to children, and punishment to the adults who are lacking in the Christmas spirit. He even donates presents to the local children’s hospital, that’s how serious he is about Christmas. When word gets around that someone dressed as Santa has killed a couple of people and Harry turns up to distribute gifts, the local community chase him, acquiring flaming torches (!) somewhere along the way just to show how serious they are. There are two things about Christmas Evil that ensure its wonderousness. 1) the wackadoo plot, which on one level makes pretty much no sense (which can be in itself pretty funny) and yet, has moments that touchingly evoke the tensions inherent in the season and the possibilities of the Christmas spirit being attainable. 2) Brandon Maggart’s all-out performance. Maggart is fantastic. Christmas Evil would not be worth a second glance if it wasn’t for him. He is on a different plane, sometimes seeming in almost silent film mode. I can’t decide what I enjoyed more, him practising his Santerly Merry Christmas, booming the phrase in a variety of intonations in the snow outside the children’s hospital or plunging his face in mud to spy on the very naughty Moss Garcia and then inexplicably pressing his face to the side of the house, or expressively running from the lynch mob. However crazy Harry or how silly the film gets, there is a real sense of pathos to the character. There isn’t a lot of killing, and thankfully his interest in children is purely based on moral standards of right and wrong, which places the emphasis squarely on Harry’s attempts to become a good Santa. Don’t mistake me, there are a lot of things about the film that don’t make sense, and/or are ridiculous or a bit ropey. Most prominently, why would a Christmas trauma cause a person to obsessed with Christmas? But we are in the realm of 80s low budget cinema, narrative sense, character development or roundedness and reason are not needed here. Happily though, in this example, this doesn’t preclude a touching sense of what makes Christmas special. I can’t believe I had never heard of it before, but that makes the discovery so much sweeter. As much as I will always reach for Black Christmas (Bob Clark, 1974) round the festive season, Christmas Evil is now definitely on my list.